Menstrual issues-Sage contains phytoestrogens that facilitates menstrual issues. Menopausal women get relieved of hot flashes and night sweats and it also helps to regulate blood flow. Fights Infections-Sage contains polyphenols that fight infections and effectively treat mouth sores, mouth ulcers, infected gums, sore throat, cold and fever. 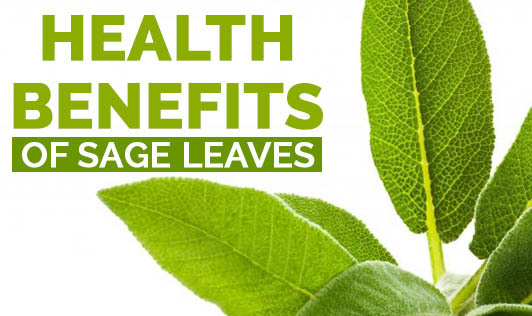 Reduces Inflammation-Rosmarinic acid in sage reduces inflammatory responses in the body and is helpful in inflammatory conditions like arthritis, respiratory diseases and heart disease. Prevents Cancer- Sage contains flavonoids like apigenin, luteoin and diosmetin, which prevent variety of cancers. Improves Brain Function -According to studies, acetylcholinesterase (AChE) inhibitors present in sage can prevent Alzheimer's disease. Improves Memory-Sage is known to improve mood and mental performance in healthy adolescents, and memory and focus in older adults. It's also seen to reinforce thinking and learning in older adults with delicate to moderate Alzheimer's disease. Aids Digestion-The herb is a good carminative and prevents gas formation. It is also seen to improve appetite and aid digestion. Improves lipid profile in diabetics- Sage is seen to reduce triglycerides and cholesterol levels in type 2 diabetic patients. Prevents Cellulites-Sage oil increases blood circulation and helps in reducing cellulites. Hair and skin- Sage oil improves blood circulation and promotes hair growth. It also strengthens weak hair and scales down premature graying of hair. It is also seen to treat several skin problems.